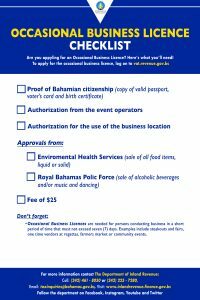 Bahamian citizens or Permanent Resident with right to work in The Bahamas or Non-Resident (as a traveling salesman and must have a valid work permit). Scan and upload the approvals along with other supporting documents in the online application form in the ‘Supporting Documents’ section. Ensure the online Business Registration Application form indicates that it is an Occasional Licence. Letter of approval for event/show. Authorization for use of the business location. Department of Environmental Health Services approval (sale of all food items-liquid or solid). Royal Bahamas Police Force approvals (sale of alcoholic beverages and/ or music and dancing). The tax for an Occasional Licence is BS$25. Once all document requirements are met and approved, the application is then processed within 7 working days. The Department of Inland Revenue will contact the applicant via the online user account for additional information or clarification if needed. You should regularly check your messages in your online account and the email address you provided for correspondence from the Department.